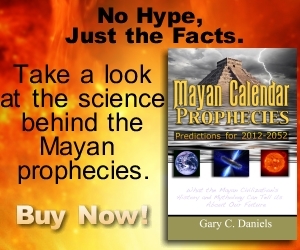 TheRealMayanProphecies.com » Featured, Mayan Mythology » Did a comet hit Earth the last time the Mayan calendar ended? What happened the last time the Mayan calendar ended? According to Mayan myths, the current creation was the result of a great flood that destroyed the previous creation. The description of this event in Mayan historical chronicles sounds like an eyewitness account of an oceanic impact of a comet or comet fragments followed by a mega-tsunami that devastated coastal civilizations. Luckily the Maya even recorded the date this event occurred on and it matches with physical evidence in the ice core record, tsunami record, and climate record that a catastrophe did befall Earth precisely when the Maya said it did. Both of the above accounts are consistent with an interpretation that they represented eyewitness accounts of an oceanic impact and its aftermath. The order of events is identical to what one would expect in an impact event. 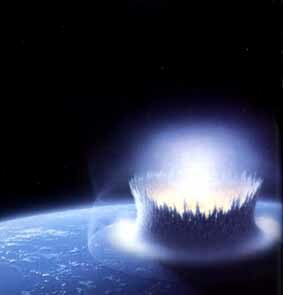 First, fire would descend from the sky as the meteor sped through the atmosphere ablaze. Upon impact it would eject enormous amounts of debris that would rain down upon the earth followed by massive tsunamis with wave heights hundreds if not thousands of feet high. Since both accounts blame Mayan gods named Bacabs for this event the first question is, who were the Bacabs? In the Chilam Balam of Tizimin it states, “The four Bacabs slide to earth on the back of a green rainbow. One by one the stars fall.” Thus it seems likely the Bacabs were green fireballs which is consistent with the impact hypothesis. Thus from the evidence recorded in Mayan mythology a hypothesis can be proposed that the Mayan flood myth represented an oceanic impact event followed by a mega-tsunami, i.e., “avalanche of water.” The next step is to see if there is any evidence of mega-tsunami in the sedimentary record dated to around 3300 BC. Researcher Edward Bryant noted in his book Tsunami: The Underrated Hazard that he found evidence near Australia of “six separate tsunami events…over the past 8,000 years, with peaks at 7500 B.C., 5000 B.C., 3300 B.C., 500-2000 B.C., A.D. 500, and A.D. 1500.” Researcher Mike Baillie noted that of the “’six separate [Australian] tsunami events that can be recognized over the last 8000 years’…two dates stand out, namely 5250 cal. Yr BP (3300 BC) and 1450 cal. Yr BP (AD 500)” because these same dates can be found over and over again in publications devoted to tsunami research. Furthermore, in the North Atlantic Bryant found “additional evidence for at least seven major tsunami…[that] occurred in 60 BC, 218-216 BC, 1763 BC, 1862 BC, 2153 BC, 3309 BC, and 4000-5000 BC.” He also found tsunami events in the British Isles in “AD 500, 3250-3150 BC, and 3300 BC.” Thus there is evidence in multiple locations around the globe that tsunami events occurred around 3300 BC. It has been theorized that major impact events are also associated with severe climate downturns, most notably in the book The Cosmic Winter by astronomers Bill Napier and Victor Clube. Thus if these tsunamis were impact-induced there should be a record of a significant climate downturn at the same time. In fact, there is. In 2002 Dr. Lonnie Thompson of Ohio State was working on a glacier in Peru when he found a “wetland plant that had been remarkably preserved under the ice. Later testing yielded viable DNA from the plant and dated it back 5,200 years ago (3200 BC).” He noted that “this…soft-bodied plant…had to be captured by a very large snowfall at the time, a snowfall and climate change that began very abruptly fast enough to capture a plant but not kill it. That is astounding.” (Read full article.) Taking into account a margin of error of 100 years this climate event could very well have occurred around 3300 BC. 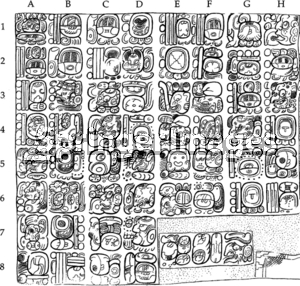 Thus multiple lines of evidence support the idea that multiple oceanic impact events occurred around 3300 BC which supports my hypothesis that the Mayan flood myth recorded in Temple XIX at Palenque and in the books of Chilam Balam was a record of these events. For a more in-depth discussion of the Temple XIX inscriptions, the Mayan flood myth and various other myths around the world which also record this event read my book Mayan Calendar Prophecies: Predictions for 2012-2052. One Response to "Did a comet hit Earth the last time the Mayan calendar ended?"